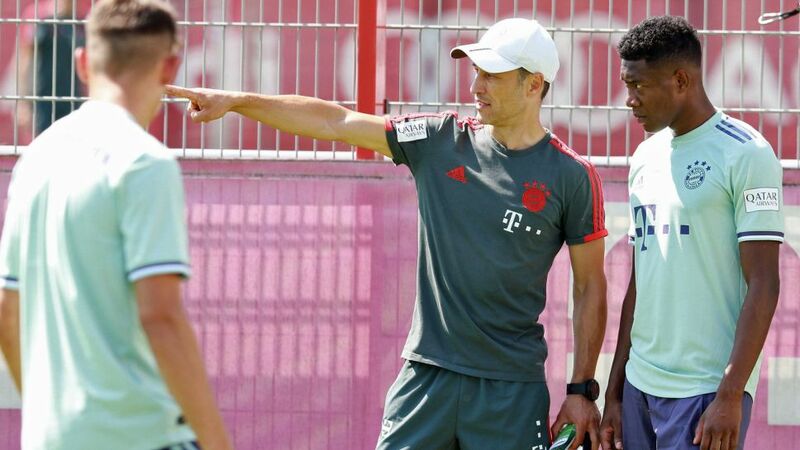 Bundesliga | David Alaba: "Bayern Munich playing as a team under Niko Kovac"
David Alaba: "Bayern Munich playing as a team under Niko Kovac"
David Alaba has praised the training methods of Bayern Munich head coach Niko Kovac, following the record German champions' 100 per cent winning start to the 2018/19 season. Kovac had some big boots to fill after picking up the baton from decorated veteran Jupp Heynckes in the summer, but Alaba says the former Croatia and Eintracht Frankfurt boss is thriving in the role. "He's an experienced coach, but with clear and fresh ideas," the Bayern left-back told spox.com. "He knows exactly what he wants. As a person, he's a top bloke. He's not a buddy type, but he is someone you can talk to. He gives you the feeling that you can talk to him about absolutely anything. In training, you can see how ambitious and hungry for success he is. He comes across very well." Kovac's approach has already had the desired effect. Bayern have been in ominous form so far this term, avenging their defeat to Frankfurt in last season's DFB Cup final by thrashing their recently installed coach's former club 5-0 in the Supercup. The Munich giants have also seen off minnows Drochtersen/Assel in the DFB Cup first round, as well as Hoffenheim and VfB Stuttgart in the Bundesliga. "Both in terms of tactics and attitude, we've been able to implement his tactics: namely his switch from defence to attack and attack to defence," said Alaba, who has been involved in three of Bayern's four competitive outings so far this term, only missing the DFB Cup game through injury. "He's got us playing as a team and we've started the season very, very well. Our objective was to go into the international break unbeaten, and we've done that. We can be very, very happy with our progress." Bayern return to domestic action when they welcome Bayer Leverkusen to the Allianz Arena on Saturday. The fixture marks the beginning of a jam-packed September schedule, with three Bundesliga games in the space of six days - Schalke (22 September, away), Augsburg (25 September, home) and Hertha Berlin (28 September, away) - coming hot on the heels of the Bavarians' UEFA Champions League group stage opener at Benfica (19 September). Alaba, 26, is in his 10th season as a Bundesliga player. The Austria international, who joined Bayern as a 15-year-old from Austria Vienna, has already made over 300 senior competitive appearances for the club.